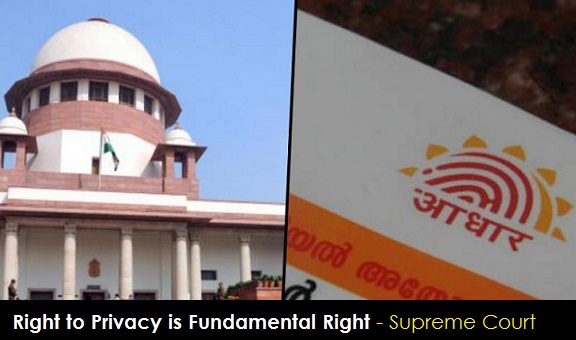 Supreme Court on 24th August declared right to privacy as a Fundamental right under the Constitution. A nine-judge Constitution bench headed by Chief Justice J S Khehar ruled that right to privacy is protected intrinsically as part of rights guaranteed under Article 21 of the Constitution. Others members of the bench comprising Justices J Chelameswar, S A Bobde, R K Agrawal, R F Nariman, A M Sapre, D Y Chandrachud, S K Kaul and S Abdul Nazeer also shared the same view. Petitions filed in Supreme challenging move to make Aadhaar mandatory for availing the benefits of social welfare schemes. The petitioners had contended that the right to privacy was “inalienable” and “inherent” to the most important fundamental right which is the right to liberty.